There have been many people with injuries to their spine or brain who managed to walk again. With or without the help of a new inventions. Those were miracles on a ‘small scale’. However, a new system might one day be the ultimate solution. Not only for partially paralyzed people, but those who lost all movement in their body. It replaces the lost connection, transferring signals of the brain to the muscles. According to Ajiboye (lead author), the miracle this time isn’t only in the device, but rather the patient. Bill Kochevar from Cleveland went on his regular bike tour, only to run into a truck back in 2006. 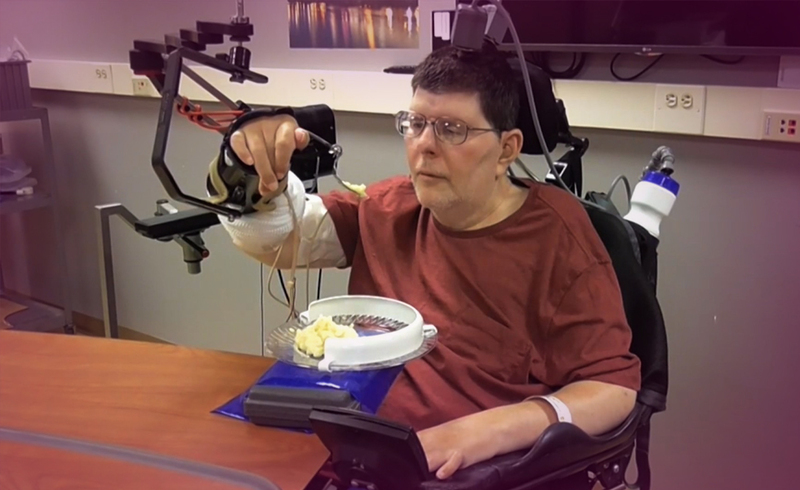 He injured his spinal cord and had no hope of walking ever again, nor could he use his arms. He is severely disabled, not being able to eat, drink or brush his teeth on his own. He saw a glint of hope in the program, so he enrolled. The basic aim was for him to be able to move his hands again using his brain. He would think about moving them, and they would do just that. As if nothing happened. The initial stages show great success, however, it isn’t that simple. He went through two surgeries, one to implant a device in his brain, and another ‘few’ in his arms. He first learned how to use the electrodes by ‘moving’ an onscreen arm. Then, later, experts would move his actual arms, while he had to imagine him doing the same. His perseverance is remarkable, and certainly something we can learn from. However, the device still has a lot to go through before it can help him in the long term and before it hits the market. It isn’t a perfect solution just yet, and the device needs to be smaller. It is a great first step, that’s for sure. Bill volunteered to remain a ‘guinea pig’ for the experiments for the next five years. Let’s hope that his dream comes true and he will be able to move his arms again. Let’s ask the cards to see what is in store for the device. Will it pass further tests? Will people be able to afford it? King of Pentacles: Ajiboye is a trustworthy and hardworking man. He wants to make sure that he creates something that everyone can benefit from. He won’t rest until his invention is perfect. He has all resources he needs. However, he needs to make sure that he can show real progress. Dreaming is good, but wishful thinking isn’t. It might be just too early to rely on it yet. He needs to make sure that his expectations stay within realistic measures. The device is partly based on one’s ability to leave the past behind. For it to work, you need to forget your predicament and that can be a tricky thing.